Five recently published works, including two translations of medieval texts, and one book you can download for free. 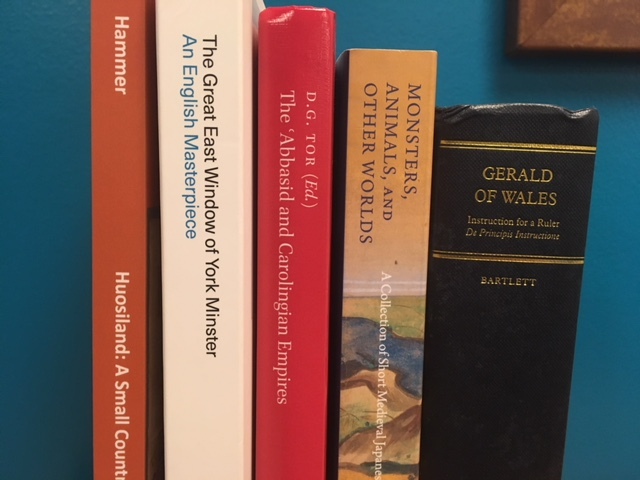 Excerpt: Gerald’s Instruction for a Ruler is of interest for three main reasons: it provides a detailed, and violently partisan, account of the the last days of Henry II of England; it is full of miscellaneous but valuable stories and anecdotes (e.g. the account of the discovery of the tomb of Arthur and Guinevere, the legend of the destruction of the Picts); and it is a monument to the literary and intellectual culture of a highly accomplished writer at the heart of the so-called twelfth-century Renaissance. Excerpt: Borders loomed large in the imagination of the medieval Japanese – borders of the country, the capital, and the rural village; the gate of a home; the foot of a mountain; and the edge of the sea – for it is at borders where one might encounter demons, monsters, serpents, dragons, gods, and the spirits of the dead, as well as the anthropomorphized animals, birds and plants. Border crossings form a critical element of a large body of Japanese vernacular literature called otogizoshi, or Muromachi tales, a genre of four to five hundred relatively short stories that were written from the fourteenth through to the seventeenth century. Excerpt: The period from the mid-eighth into the tenth centuries witnessed what one can arguably call the founding of both Western Christendom and Islamic civilization. That is, while the religious core of both Christianity and Islam were obviously formed prior to these respective dynasties (in the case of Christianity centuries before), under the aegis something fundamentally new, or so transformed as to be new, came into being. Except: On 30 July 1361 Archbishop John Thorseby (d.1373) laid the foundation stone for a new extension to the east end of York Minster. This new building would ensure that the Gothic cathedral was ‘adorned with uniform beauty’. Thoresby was initiating a construction campaign that by 1420 had completely replaced the 12th-century choir of Archbishop Roger of Pont L’Eveque (1154-81). Thoresby’s project substantially enlarged the eastern arm of the building, a majestic space lit by the Great East Window, the subject of this book, the largest expanse of medieval stained glass in Britain and one of England’s greatest medieval masterpieces. Excerpt: In its broadest and most general sense, Huosiland is the area of Bavaria to the west and directly to the north of the episcopal seat at Friesing and lying between the rivers Isar and Lech. In the west, the Alemannic diocese of Augsburg, which belonged to the Frankish province of Mainz, not to Bavarian Salzburg, extended eastwards beyond the Lech and covered the western portion of Huosiland, but, unfortunately, all of Augsberg’s early records except for the survey noted above have been lost.